How to deal with the green elephant in the room? After I quit using Gmail earlier this year, Evernote has become my biggest silo and single point of failure in my workflow. I have been using it since October 2010 with a premium account, and maintain some 4500 notes, about 25GB total in size. 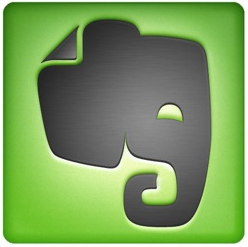 With my move away from Gmail, my use of Evernote has actually increased as well. Part of my e-mail triage process now is forwarding receipts etc to Evernote, before removing them from my mail box. As with leaving Gmail, there are no immediately visible alternatives to Evernote, that cater to all convenient affordances I have become accustomed to. 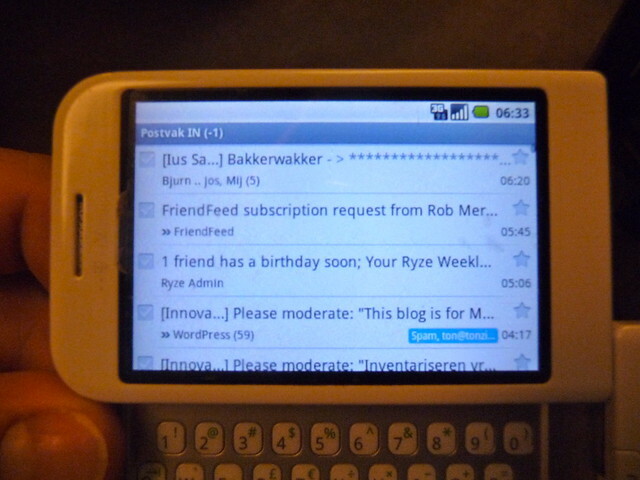 This was already apparant when I quit Gmail, when Peter Rukavina and I exchanged some thoughts about it. 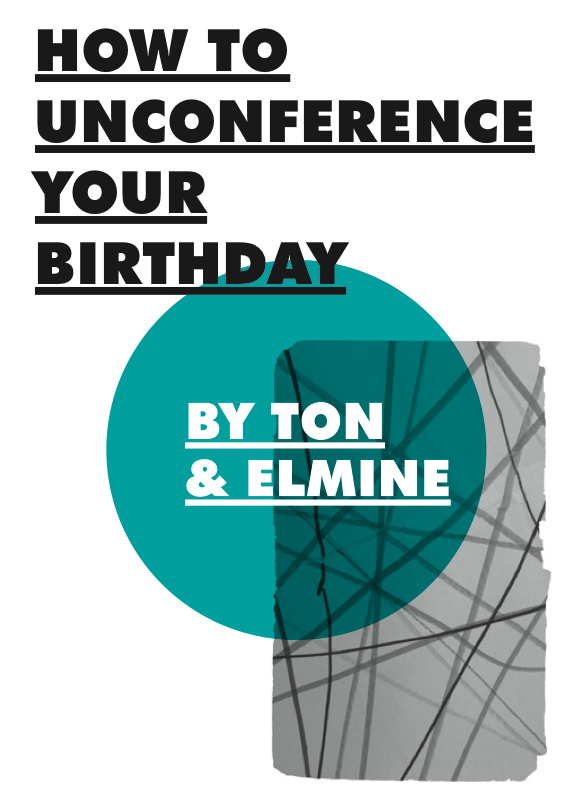 So in order to make the first steps towards ditching Evernote, I will follow the recipe I derived from leaving Gmail, as I presented it at the Koppelting conference in August. Why do I want to leave? Next steps will be coming up with viable solutions and alternatives for each of those points, and see if I can then integrate those into a coherent whole again. Terry Frazier pointed me to The Brain again today on FB. The Brain is a tool I heavily used from 18 to 13 years ago. It turns out this mindmapping/note taking tool is still around. It currently works cross-device and has Android and iOS apps, and allows attaching files and navigating links in a visual way. It comes at a hefty price though, and still looks like it really is from 1998. Will explore a bit if it might fit my needs enough to give it another try. This weekend the grassroots FabLab conference ‘Koppelting‘ is taking place in Amersfoort, Netherlands. 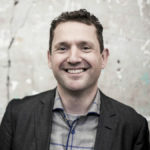 Together with Dirk van Vreeswijk I’ll be doing a session this morning on how to leave Gmail and other walled gardens. In this session I try to summarize the way I constructed my path out of Gmail in such a manner that it becomes a guide that may enable others to act for themselves. The talk explains why I wanted to leave Gmail, how I finally found a way, and what the replacement solution(s) are I now use. It ends with a ‘recipe’, based on how I found a way out of Gmail, to help you think about what keeps you in your own walled gardens, so it becomes easier to explore alternatives. 250.000 conversations, across 770.000 messages. 21GB total. This is described in more detail in my earlier posting that triggered this session. For each item that made Gmail attractive to me I searched for an alternative. Recombining them into a new workflow is a viable alternative for my Gmail usage as a whole. Apart from the technology replacements, key part is up front contemplation and more continuous reflection on my working process. I’m a piler, not a filer, but adding a few seconds during e-mail triage to at least decide putting it in a pile that is not my Inbox, makes all the difference. The slides are available in PDF on this site, and will be embedded below (currently upload is failing). The outline and collaborative notes from the session are online on one of the etherpads of the Koppelting conference. Koppel is an old Dutch word for communal fields, Ting a Germanic word for a meeting of the free. Organized by the Amersfoort FabLab, a fully opensourced bootstrapped FabLab, Koppelting is the annual grassroots festival about peer production and free/libre alternatives for society. As I am moving out of Gmail, I had to find a way to deal with the 21GB mail archive from the past 12 years. Google lets you export all your data from its various services, including email. After a day or so you get a download link that contains all your mail in one single file in MBOX format. MBOX is a text format so it allows itself to be searched, but that would only tell you that what you are looking for is somewhere in that 21GB file. I could also import it into my mail client as a local archive, by dropping the MBOX file in the Local Folder of Thunderbird with Finder. That provides me with a similar access and search capability as I had for all that mail in Gmail. However, if I would like to do more with my archive, mine it for things, and re-use stuff by piping it into other workflows having it in Thunderbird would not be enough. So I searched for a way to more radically open my archive up to search. I came across DevonThink, but that seemed a bit overkill as it does so much more than merely digesting a mail archive, and as such provides way too much overlap with my Evernote. (Although I may rethink that in the future, if I decide to also move out of Evernote, as after Gmail it is my biggest third party service that contains lots of valuable information.) I looked for something simpler, that just does what I need, putting e-mail into sql, and that is how I found Mailsteward Pro. There are three versions of Mailsteward, and I needed the Pro version, as it is the one that works with MySQL and thus can handle the volume of mail in my archive. It costs $99 one time, not cheap, but as I was paying for storage with Google as well, over time it pays for itself. When installing Mailsteward it assumes you already have a MySQL server running on your system. I use MAMP Pro on my laptop as a local web and mysql server, on which I run different things locally, like a blog based journal and a self-assessment survey tool. MAMP Pro is very easy to install. You need to take the following steps to allow Mailsteward access to MySQL. In MAMP Pro you need to allow external access to MySQL, but only from within your own system (this basically means applications other than MAMP can access the MySQL server. Then you create a new database via the PHP Mysqladmin that comes with MAMP. Mailsteward will populate it with the right tables. In my case I aptly named it mailarchives. Within Mailsteward you then add a connection, listing the database you created, and adding the right ports etc. Note that the socket it requests isn’t an actual file on your system, but does need to point to the right folder within the MAMP installation, which is the Application/MAMP/tmp/mysql folder. 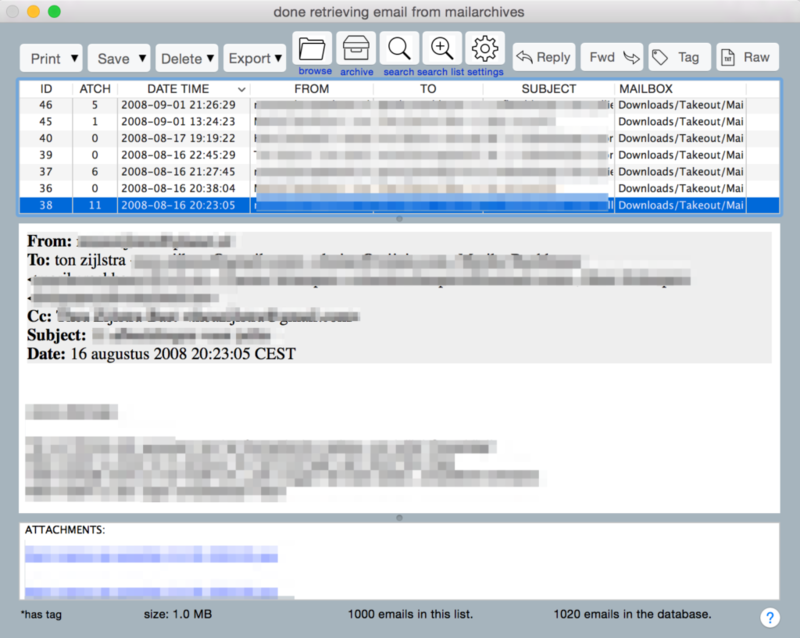 I first tested Mailsteward with my parents e-mail archive that I kept after they passed away last year, to be able to find contact details of their friends. It imported fine. Then I tried to import my Gmail MBOX file. It turns out 21GB is too large to handle in one go for Mailsteward, as it eats away all memory on your Mac. I concluded that I need to split my Gmail MBOX file into multiple smaller ones. Luckily there is a working script on GitHub that chops MBOX files up in smaller ones, and that allows you to set the filesize you want. 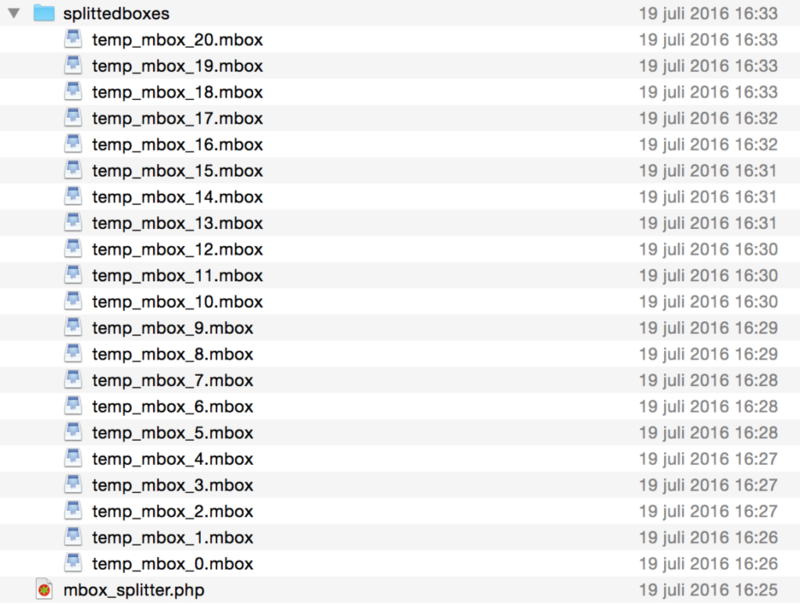 I chopped the Gmail MBOX into 21 smaller files of 1GB each. These imported ok into MailSteward. Mailsteward maintains tags and conversation threads. Using Mailstewards import feature you then add each of those files, by hand (but luckily you only need to do that once). Mailsteward allows you to search the archive through its rather simple and bland interface, but you can also tweak the MySQL queries it creates yourself. The additional advantage of having it in MySQL is that I can also access the archive with other tools to search it. Thunderbird allows me to export e-mail as MBOX files via the Import/Export add-on, which can then be added to the archive by Mailsteward. So that’s a straightforward operation. Likely I can automate it and schedule it to run every month. In the past two years I have been slowly reconfiguring my online routines to increase privacy safeguards, and bring more of my data under my own control, while avoiding making my work routines more difficult and thus less routine. 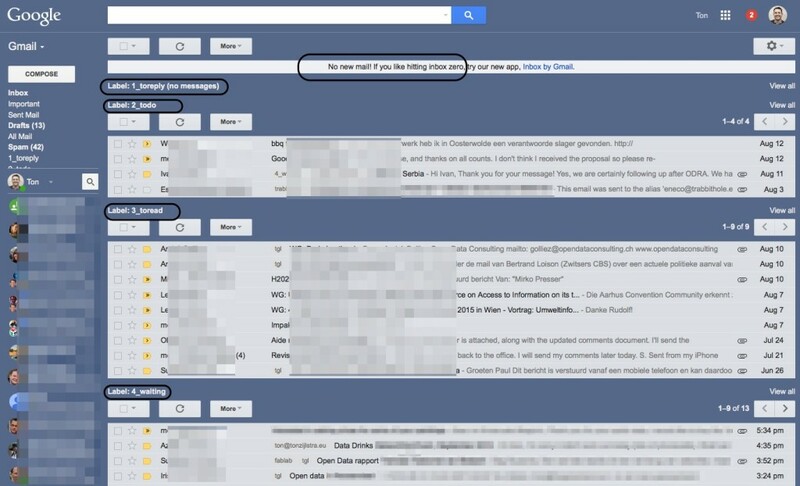 How to create an e-mail workflow that does not rely on Gmail has been the hardest part of this effort. I think I now finally have figured out how to do it without loss of convenience, and hope to have made the switch after I finish exporting all e-mail data Google has from me. Took more basic precautions on my laptop. Stopped using Dropbox in favour of running Owncloud myself on a virtual private server in a Swiss data center, so I fully control my own filesharing. Changed my logins so that each has a different e-mail address and a different password. Increased my resilience against data loss or data corruption. Not that I don’t use anything but my own stuff now, I also am still a heavy user of various services, like Evernote for instance, or my Android phone. But the usage of third party services has become more varied and spread-out, reducing the impact of losing any one of them. 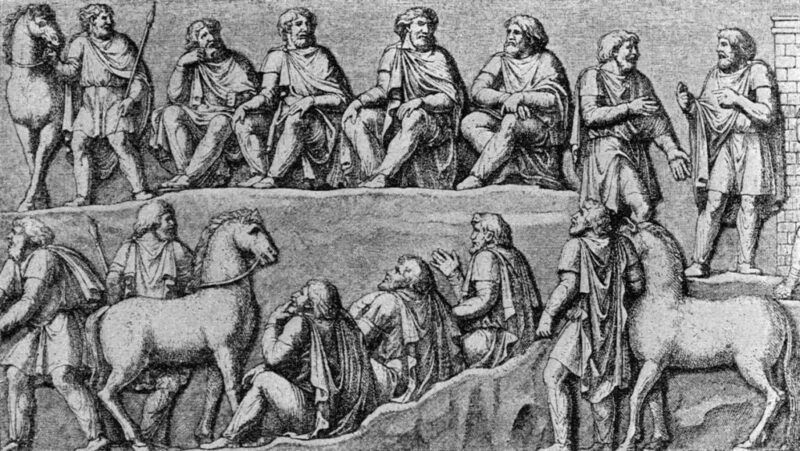 The net is a distributed place, and our information strategies and routines should embrace that distributedness. In practice however we often end up in various silos and walled gardens, because they are so very convenient to use, although they actually decrease our own control and/or introduce single points of failure. If your Facebook account gets suspended can you still interact with others? If your Google account gets suspended, do you still know how to reach people? Using Gmail also means all of my stuff resides on servers falling under the not very privacy sensitive US laws. Since July 2004 I have however completely relied on Gmail. It is an easy way to combine the various e-mail addresses I use into 1 single inbox ( or rather multiple inboxes on the basis of follow-up actions), and it has great tagging, search and filtering so that you never need to file anything or sort into folders. I have used Gmail as my central inbox for everything. Since 2004 I have accumulated about 770.000 emails in 249.000 conversations, for a total of 21GB. Gmail is therefore the largest potential single point of failure in my information processing. Finding a path away from Gmail took two realisations, one about process and one about technology. Concerning process I realized that Gmail allows me, or even invites me, to be very lazy in my e-mail processing routines. Because of the limitless storage I merely needed to be able to find things back (through the use of tags for instance), and never needed to really decide what to do with an e-mail. This means for instance that lots of attachments only live on in my mailbox, without me adding them to relevant project documentation etc. Likely I spent hours in the past years searching for slide decks in my mountain of e-mail, in stead of spending half a minute once to store and archive an attachment in a more logical place where I’m more likely to find it with desktop search, or serendipitously bump into it, and then throw the mail message out. So mail processing has to become a much less lazy process with a few more active decisions in handling messages. E.g. attachments into a project folder, contact info into contacts, book keeping related messages to bookkeeping (and no longer going through all mail tagged bookkeeping every quarter to do my taxes), tasks and actions to my Things todo application. I already wrote several Apple Scripts to let my todo app and Evernote talk to various other software packages (like Tinderbox), but it is now likely I will write a few more to automate mail message processing further (because I prefer to still keep my process as lazy as possible). A second key realization was that my original reasons for staying within webmail had meanwhile been solved with better technology: it used to be that only Gmail provided the cross-device access to all my mail accounts simultaneously, something I could not easily do in 2004 with a desk/laptop mail client in combination with a mobile mail client. Now, with much broader IMAP support (not just by my software tools, but also by hosting companies) this is much easier, increasing the range of possible alternatives. Threading mail conversations is now also a more universal feature. This now allowed me to start using Thunderbird mail client, including PGP encryption, on my laptop (I never intensively used a mail client before on my laptop), in combination with the open source K9 Android mail app (replacing the Gmail app for me), also with encryption options. Both allow tagging of messages, and Thunderbird allows filtering for not just incoming mail but also when sending and when archiving, which is really useful. As an alternative to piping all my mail accounts into Gmail, I now use all the real inboxes of those mail accounts where they’re originally hosted, and use IMAP to combine into one user interface on my laptop and mobile. Those separate mailboxes do have lower storage limits (usually 500MB), so it is more likely I bump into limits, and that is the reason I need a much less lazy mail processing routine (especially concerning larger attachments), in which I can regularly archive older mail. Separately I also now use a different webmail provider, Protonmail in Switzerland, that comes with default encryption. I’ve attached a domain name to it (zylstra.eu). The above shows how leaving Gmail moving forward from the here and now, by solving the one-inbox and the multiple device issues can be done by changing process and tools. That leaves the question of how to deal with the 21GB of mail archive from the past 12 years. Leaving it all in Gmail, and use that as archive might be a work-around for old mail, but doesn’t help me for future mail. I could add it as a local folder to the Thunderbird mail client, but that thought did not appeal to me and feels clunky. I find that I never use my mail archive from my mobile, so the archive does not need to be cloud based per se. So, I opted to keep my mail archive local, by storing it in a mysql database. This allows for query based searches, and even text mining, without it clogging up my mail client itself. Gmail can export your archive in a single MBOX file, and I used Mailsteward Pro to transform it into a mysql database. 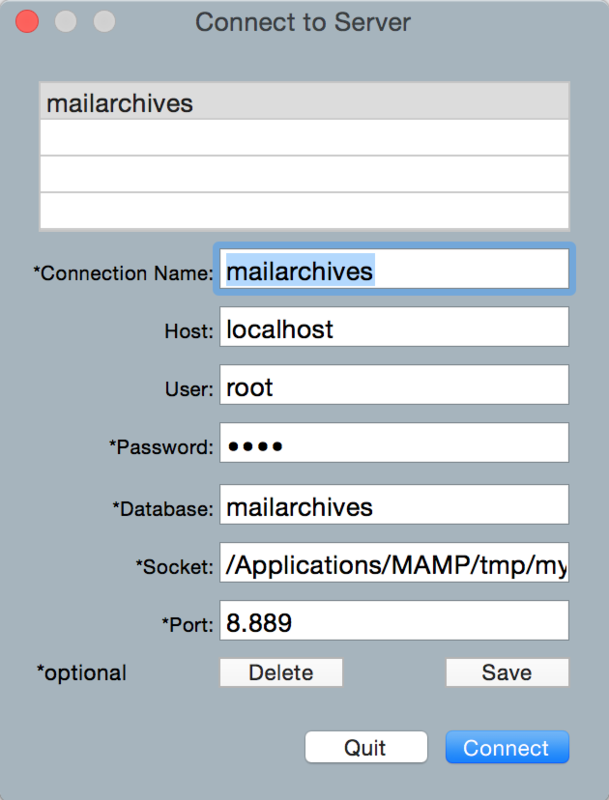 (More on that set-up in the next posting Archiving mail in mysql with MAMP and Mailsteward). With the archive now locally stored, the database is backed up to both my NAS drive and my VPS. With the basic set-up for leaving Gmail now in place, there is still work te be done over the coming months. Clearing out the archive at Gmail is one step, once I feel comfortable with searching my new mysql archive. Creating more filters in my mail client, and writing a few scripts to integrate my mail processing with the other tools I use is another. There are also likely a whole bunch of things (accounts, subscriptions etc) that use my gmail address, which I will change as I go along. My longtime blogging friend Roland Tanglao suggested to mine my mail archive for things that could be published, contact data, harvest old ideas that can feed into my work now etc. This sounds appealing but needs some contemplation and then a plan. Having the archive in mysql makes it a lot easier to come up with a plan though. Beyond mail, there are of course more Google services I use heavily, especially Calendar, which are tied to my gmail address. I could move that to my Owncloud as well. I will keep my Google account, as this isn’t about ditching Google but about reducing risks and taking more control. Apart from Calendar there are no other single points of failure in the way I use my Google account. Beyond Google, Evernote is another silo I’m heavily invested in, and the content I keep there is arguably more valuable to me than my Gmail. So that is a future change to think about and seek alternatives for. [Find the outline and slides of my Koppelting session on leaving Gmail in the follow-up posting at https://tzyl.eu/leavegarden. You can use the shortlink https://tzyl.eu/gmail to refer to this posting. Last week I have made changes in the way I process email. Adapting it more towards ‘Getting Things Done’, which I had avoided doing for years, and making some changes in daily habits around it. Now that I made the change, I can’t quite understand what kept me from doing it, even though before I thought my needs would not be met with a new routine. As I use Gmail and have the notion I really shouldn’t, I mentally postponed changing my routines until ‘after replacing Gmail’, assuming I would otherwise either increase the cost of leaving Gmail (by having routines more deeply connected to its functionalities), or I’d find a replacement that already contained a better flow by default, making designing change now a waste of time. I know, neither make much sense upon closer consideration. Likely the real reason I made the change now, is having come back from a long vacation, and not many obligations yet as most clients are still away themselves. That, and receiving an external trigger right at that moment. Over the years I kept all my e-mail in my inbox, always. Piling, never filing (tagging I do). The original reason for that was that my first mobile e-mail app would not let me easily access and search archived mail, only what was in my inbox would be readily available. The first step of my mail process is usually on my mobile. From the newly arrived mail, I would ‘star’ those I thought would need some sort of follow-up. Things that don’t interest me I would leave unread but not throw out. This would be my basic triage method. I also have various filtering rules that label incoming mail (apart from ‘starred’) according to what part of my professional activities they represent (my company, my fablab stuff etc.) Using Gmail’s multiple inbox feature, those stars and labels were presented on my laptop screen as separate lists next to the main inbox. The problem with this was that a starred mail could still mean many things (migh be interesting, immediate action, little or lots of work, read, keep in mind etc.) I basically needed to reevaluate every single mail, every time I opened up the ‘starred’ list. Over time that list would grow with unprocessed items from the past, becoming a ineffective mental drag, except for the recently starred messages. Also some of the multiple inboxes had survived beyond their waned usefulness due to changing focus and activities, and I had difficulty putting them to new good use. use many more filtering rules to automatically process and label incoming mails, alerts, mailers etc. Changing my mail process and method of triage turned out to be easy. It moved the decision what to do with an e-mail forward 1 step, and made it part of the triage. (Before I would only star a mail and then decide later). This makes my normal daily time slot for mail sufficient to actually deal with the contents of that mail. Main ‘win’ is that my mail interface is much less noisy, both due to heavier automated filtering and removing processed messages from the inbox. Before I would see whatever was left over from ‘before’ and always have a full page of messages in front of me. That clutter is now 5 short lists, with only one of those lists needing attention at any given time. All other stuff from mailing lists are available under a label/tag, when I decide I want to catch up but never clog up the inbox. My main demand, being able to do triage ‘on the go’, is still being met (and more automated than before). The reduced clutter also feels like it might be a benefit when I move out of Gmail. The only thing to still do is to much better connect the list of mails labeled to-do to my actual task management tool (Things, by Cultured Code) and making sure they get the right follow-up that way. I could probably automate that, but haven’t figured out how to do that yet. This may mean that the to-do part of the mail flow will actually disappear from my gmail altogether.